Fresco have been custom designing canopies and side screens for the education market for many years. Our experience and commitment to quality allows us to provide staff and students alike with with the very smartest outdoor solutions, whatever your needs. Our one stop design and installation service make it easy. Provide a shaded pool side area. Provide a covered area for students waiting for the bus or parents. Our experienced designers are used to dealing with a wide variety of situations. We will take your brief and come up with the best design for you, from canopies to louvres, side screens and doors, our design team will rise to any challenge. We can create immediate solutions, but also design modular plans to suit your budget – add on to your shade structure as budget permits. Fresco Products are proudly designed and make in NZ. Canopies can be attached to your building or free standing (e.g. over a play area or pool). 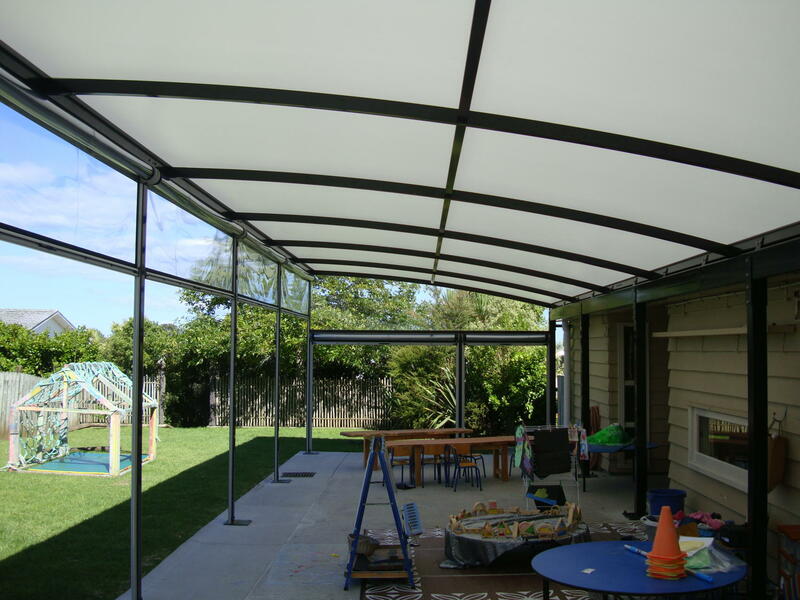 View our canopy styles page for examples. New Zealand’s harsh weather can create challenges for schools and kindergartens, making life unpleasant with the frequently changing conditions. Fresco know the frustrations, and have designed our product to help. One of our sales reps will visit your school or kindergarten for a free, no obligation quote.Our reps will look at your situation, measure the space and advise how best to proceed. They will show you some fabric samples and steel colours, and discuss side screen options. Within a few days we will come back to you with a quote.